It’s late afternoon, and though I’ve crashed Katherine McLaughlin’s siesta, she has kindly motioned me into her cheese shop (that is, after scolding me for taking photos without asking). The shop is rather a fridge, elegantly arranged with cheeses from Catalunya, the Balearics and farms across Spain. I tried a creamy goats’ cheese El PetitOt d’Alba from Menorca (charmingly named after the cheesemaker’s son Ot) atop a slice of quince jam followed by a sheep’s cheese Torta de la Serena infused with thistle heads. The nutty manchego did not disappoint and its flavor is amplified with a glass of manzanilla. 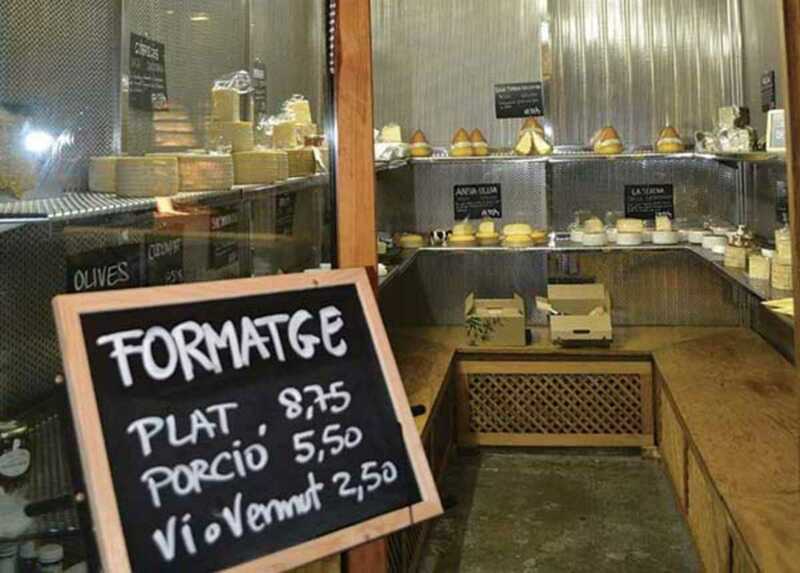 Fortmatgeria La Seu is Barcelona’s only cheese shop specializing in Spanish cheese, the brainchild of a Scottish expat. How did it come to be? McLaughlin comes from a family of adventurers. Her siblings moved to Barcelona ahead of her and, after shelving the high life of a civil servant in Paris, she joined them. She spent the next four years, as she puts it, “messing around.” A return visit to Scotland via London proved a turning point: wandering through Covent Garden, she stepped into Neal’s Yard Dairy, took a long, hard look at the wooden shelves piled high with wheels of fresh, organic cheese, and that was that. Over time she formed a stringent set of criteria for choosing products. The cheese must be from a small farm that uses its own animals and makes unpasteurized produce. No vacuum packing, no painted wax. No intense refrigerat­ing. The rules pay off. Prices are reasonable and the cheese is outstanding. There is also a tasting opportunity by reserving a table at the secret part of her shop where guests are welcomed at high wooden tables framed by bales of wheat and fairy lights. “Nothing is excessive here, it’s a ‘correct’ Catalan aesthetic,” McLaughlin jokes.